Not to be confused with Bowser Jr.'s Fiery Flotilla. Bowser Jr.'s Flotilla is the second-to-last level of Paper Mario: Sticker Star. This level features the final battle with Bowser Jr., the final Blue Door location and the final Comet Piece. The player must get here via Flutter for the first time that they visit here. When Bowser Jr. is defeated, Mario and co. can travel to Bowser's Sky Castle. The player first begins on the ship's deck. There, Mario can find a Save Block. After a series of rooms, the player will have to paperize a Bill blaster to continue. 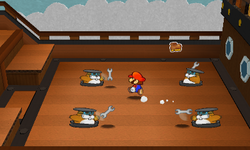 After some more rooms, the player will need to avoid some Rocky Wrenches and make their way to the boss. During this final battle with Bowser Jr., he will have a shield on his car, and up to 300 HP. Mario's best suited sticker for this battle is the Tail stickers. Bowser Jr.'s main attack is throwing projectiles at Mario; Mario can deflect them by using his tail; if he deflects a spiked ball, then it will fly back at Bowser Jr., thus causing damage. After Bowser Jr. has taken enough damage, his shield will break, leaving him vulnerable to any other attack. Once defeated, Mario can gain the last Comet Piece of the game.